✅PROTECT YOUR PANS!!! 9 INCH & 12 INCH SILICONE KITCHEN TONGS SET made of thick 1.0 MM sturdy stainless steel with heat-resistant BPA-free silicone tips. They’re so durable you’ll never need to replace them again! The handle has a soft and ergonomic silicone grips to offer a perfect grip. These silicone cooking tongs are DISHWASHER SAFE and for FASTER CLEANING you can simply rinse them under hot water. 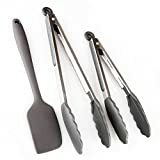 ✅11 INCH SILICONE SPATULA – Get BoP Home Products Premium Silicone Tongs Set (9″ & 12″) at a special price! ORDER TODAY to also receive our special Silicone Spatula with a Steel Core which you can use in thousands of different ways in the kitchen. ✅INNOVATIVE HYGIENIC DESIGN – Our silicone kitchen food tongs are specially designed to leave no space for bits of food to hide or bacteria to breed. Whether it’s hot or cold, our premium food-grade silicone does not expand or contract to trap food and bacteria. Even after a very short wash, your new tongs will be super-clean and safe. ✅TOUGH ENOUGH FOR A PERFECT GRIP, BUT SOFT ON YOUR POTS AND PANS – Our premium food-grade silicone spatula and tong’s tips have edges soft enough to leave bowls clean and pots or pans completely unscratched! Never risk even a single scratch on your expensive non-stick and coated surfaces.The high-quality silicone is heat-resistant up to 480°F so these tongs won’t melt, flake or warp like other cheap counterparts. ✅100% MONEY-BACK GUARANTEE – You can automatically benefit from our ironclad satisfaction guarantee. If for any reason you are not completely happy with our products, you will receive a full and prompt refund or/and replacement. NO QUESTIONS ASKED! Take advantage of this RISK FREE purchase and of the special launch price today by clicking the Add to Cart button now, before the price goes up again. We’ve got THE PERFECT COOKING SILICONE TONGS & SPATULA SET for you. Introducing CHEF HESSLER’S PREMIUM SILICONE TONG PACK (9″ & 12″) made of high quality 1 mm THICK STURDY STAINLESS STEEL HANDLES & HEAT RESISTANT BPA-FREE SILICONE, designed to exceed your expectations. – Easy to use offering a comfortable grip. – Beautifully design with ergonomic handles and a ring locking system for easier storage. – Strong, Durable & Flexible- tongs handles will ensure stability, strength, and leverage when working with big and heavy meat cuts. [ TIP! ]★Click the “Add to Cart” Button Now to get this exclusive 3-PACK!Get it now before the price goes up again!